Over the course of the past few years, I've been attempting to clean up my diet and make better choices about what I put in my body. While some people are able to make sweeping changes overnight, I've been slowly removing and subsequently introducing new foods into my diet over a period of months and years. For me, slow and steady wins the race. I've been trying everything from gluten-free breads, pastries, and cookies to dairy-free cheeses to all-natural, artificial-free foods. This has been a trial and error process for me as not all foods are created equal. After three long years, I am finally rounding out my list of go-to foods with a lot of clean favorites. The latest addition to my growing list is Kemps Yo². Since 1914 Kemps has been delighting families with its wholesome and delicious dairy products. What began as a small, local creamery in southeastern Minnesota, Kemps has grown to represent throughout the United States. Owned by family farmers, Kemps is passionate about delivering a quality product that delivers goodness from the first to the last bite. While I was determined to make better food choices, I didn't want to sacrifice the foods that I loved. But I knew I had to eat cleaner, healthier versions of my favorite foods. 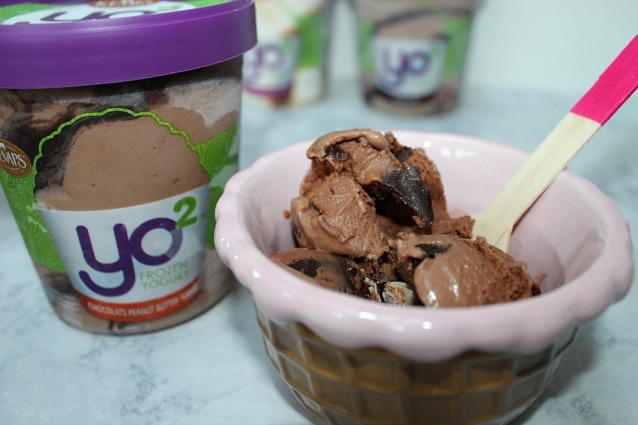 When I discovered Kemps Yo², I was thrilled to have found a frozen yogurt that contained NO high fructose corn syrup, NO artificial flavors, and NO artificial growth hormones. So, what's a girl to do? Head to her local Stop & Shop to stock up, of course! 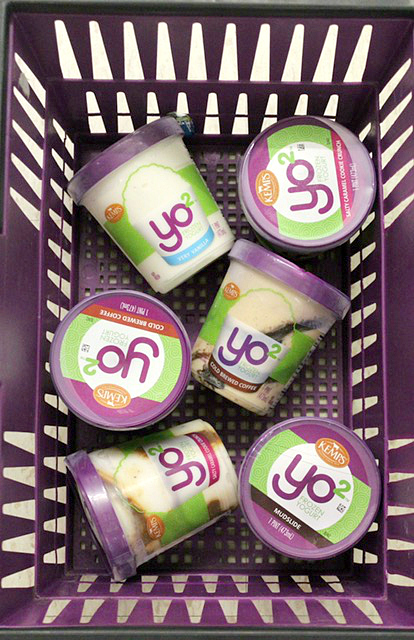 I filled my basket with the five available flavors and could barely stop myself from opening a container in the car. I mean, look at these containers. So much deliciousness in one picture. And you can enjoy it free of guilt. If you think it looks good in the container, take a look at Kemps' "Chocolate Peanut Butter Fudge" flavor served up in a bowl. 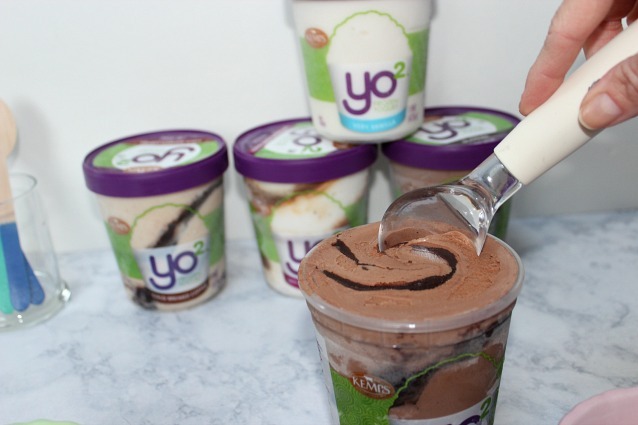 This flavor is everything, and don't be surprised if you polish off a container in record time. 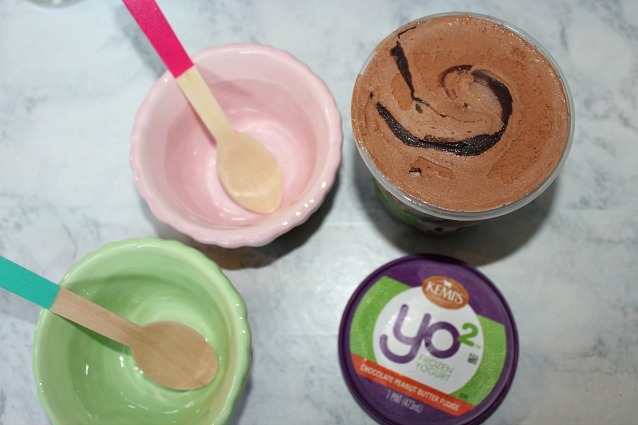 Kemps Yo² is filled with all-natural flavors and the most delicious mix-ins you can imagine. 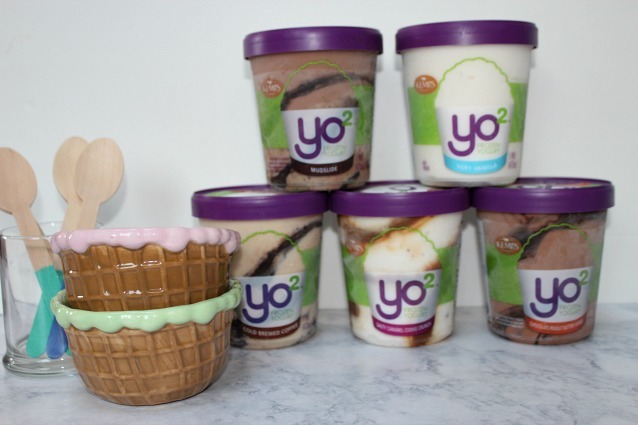 Mini peanut butter candies, swirls of rich fudge and sweet caramel are in abundance in Kemps Yo². But don't fret. If you are plain vanilla kind of guy or gal, Kemps has you covered with it's "Very Vanilla" flavor. It's nearly impossible to choose a favorite flavor. They are all so good. And I love looking forward to having dessert a few times a week and knowing that I'll get not only an amazing tasting product but also one that's good for my body too. Because I like to get creative with my food and put an even healthier twist of Kemps Yo², I set out to make a "better for you" banana split using Kemps Yo² and a few healthful toppings. The idea behind this recipe is to skip the heavy toppings such as hot fudge and hot caramel sauces and whipped cream, and substitute fruits, nuts and /or granola instead. 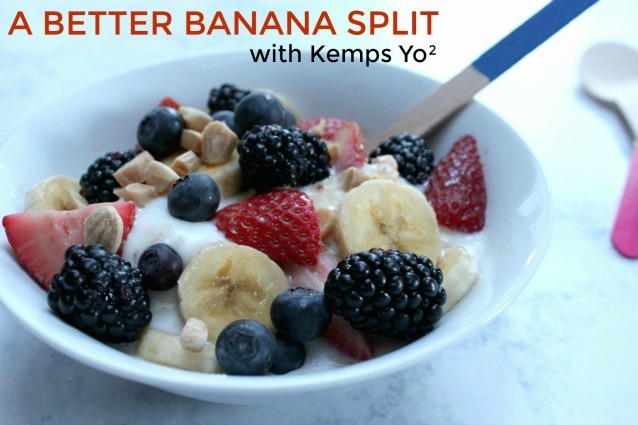 Look how easy it is to build a better-for-you (and guilt-free) banana split with Kemps Yo². Wasn't that easy? 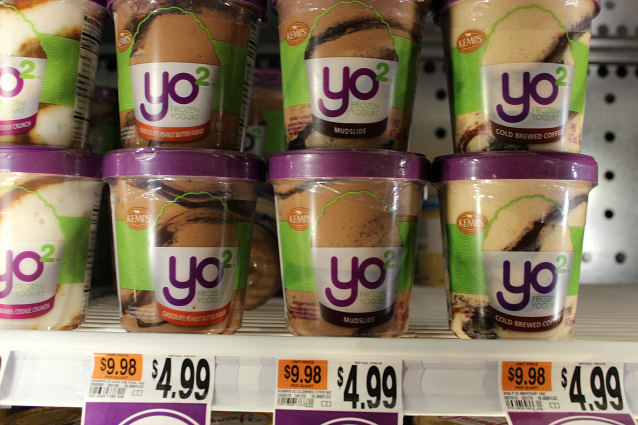 Head to your local Stop & Shop to grab several pints of Kemps Yo². You won't regret it!